Very visible oak grain pattern with this black painted real wood oak veneer. This finish matches black oak or black ash finishes from other companies. It is often said, “necessity is the mother of invention.” The Catalyst was concieved after setting up multiple home theaters with 2 or 4 of our SubMersive subwoofers only to find the main screen channels (left, center and right) to be limiting the sonic experience. In moderate to large dedicated home theaters speakers designed for a living room quickly become strained with the dynamic peaks, especially with modern soundtracks and concert BluRays. 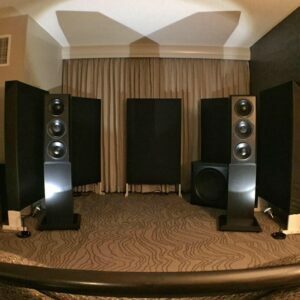 Enthusiasts and designers have experimented with speakers from the studio and commercial audio world with varying success in their search to fill a big room with even bigger sound. 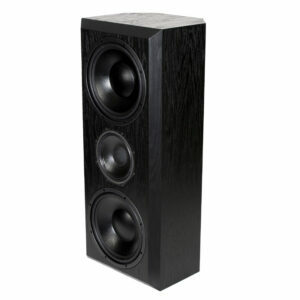 The Catalyst was designed with the expectations of filling the largest rooms with ease while maintaining the refinement required for a quality home audio speaker. Through the use of a high efficiency, coaxial midrange-tweeter complimented by 2 custom, high excursion bass drivers, it is more likely your own limits get tested rather than those of the Catalyst 12C. The Catalyst’s 8” coaxial midrange/tweeter delivers its high frequencies through the center of 8” midrange driver. This allows the entire range above 250Hz to emanate from a single location insuring listeners across the room and in multiple rows hear coherent and clear sound. The 2000W of internal ICEpower amplification separately powers the tweeter, midrange and pair of sealed woofers insuring its full capabilities are realized in every system. The 3 elements are blended smoothly and seamlessly with a DSP crossover implementation allowing precise adjustment and alignment of the sound. The end result is a refined, effortless and exciting experience.